Ages 8 through 17. 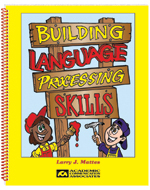 Here is a collection of activities that stimulate the development of language and thinking skills as students use language for a variety of purposes. Short stories relevant to situations commonly encountered in school and at home are included. The activities challenge student to make comparisons and solve problems as they use language for a variety of purposes. Listening and thinking skills relevant to academic curriculum standards are targeted. The lessons build language skills that facilitate learning. Solving problems in stories... and more!